that looks so cool and fun! I already have a list of things I could buy with the gift card! 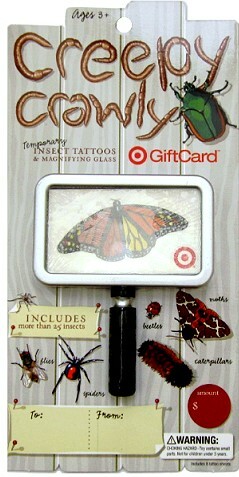 Love creepy crawly’s but LOVE target! I love shopping at Target and all the wonderful deals I’m able to acquire!! Totally Target rocks and I’m a frequent viewer! Being a full-time college student, needing to make use of my money, this page is awesome!!! You’ve got an awesome page set up for college students like me who need to get more red for our green! Thanks for all your effort!!! The gift card is super cute! I’ve got a son who would love a creepy crawly card like this… oh, and his mommy too 🙂 Thanks for the chance! I love shopping at Target, especially with a gift card!! I already like TT on facebook. Thanks Kerry for all you do! This gift card is really neat! Wow! I could really use a $50 gift card to my favorite store! Thanks for the chance to win. I already “like” you on facebook, too! I would LOVE to win a Target GC, but I”m even more interested than usual bc of the card pictured. We’ve had quite a laugh about bugs lately. My 2 yr old daughter made her dad one VERY happy guy last night when they were in the basement together and for the first time she needed her daddy to protect her. He said she started yelling “AHhhhh! It’s a crawly-bug!” And was in a real panic. My husband tried to explain to her that bugs are NOT scary to no avail. Finally, he stepped on it (bare-footed, eww!). She stopped crying. The rest of the night and today all she’s talked about is how daddy saved her from the crawly-bug! Love Totally Target!!! Hope I win! My daughter would love the butterfly card! Creepy crawly, ha ha, would love to win! Butterflies are one of my favorites. thanks for the fun giveaways – love your site. This is a unique card.